MK Chetboun’s surprise opposition to ‘anti-religious’ enlistment bill is the first crack in Coalition discipline. MK Yoni Chetboun of the Jewish Home party caused surprise in Knesset on Tuesday by declaring that he will vote against the Enlistment Bill. “I will oppose the Enlistment Bill. This bill was born in sin, as part of a wave of anti-religious legislation aimed at challenging the Jewish identity of the state,” he declared. Chetboun’s stance goes against the Coalition’s position on the issue. The Coalition has scheduled voting on the Enlistment Bill and other controversial bills back-to-back this week in an apparent attempt to maintain voting discipline. 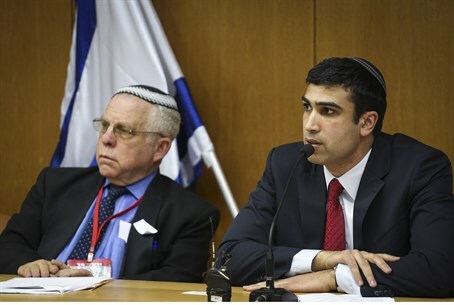 The Enlistment Bill was put together by the Equal Burden of Service Committee, which was headed by MK Ayelet Shaked, another member of the Jewish Home party. MK Shaked has expressed strong support for the bill. On Tuesday, she argued before Knesset that the bill will be good for the hareidi community, and accused its opponents of being misinformed at best. The bill also has strong support from the Yesh Atid party. Yesh Atid head Finance Minister Yair Lapid argued Tuesday that the vote on the Enlistment Bill is a vote on whether or not the government has the right to rule Israel’s citizens. Lapid also argued that the hareidi community has an obligation to abide by the bill, and enlist in the IDF, in order to “do its part” for Israeli society. On Monday, Chetboun revealed that he, and other MKs with similar views, had made “holes” in the Enlistment Bill through behind-the-scenes parliamentary work. “What they were hoping for and the product we brought to the Shaked Committee were completely different,” he declared.